Learn Spanish and Explore the Northern Andes . 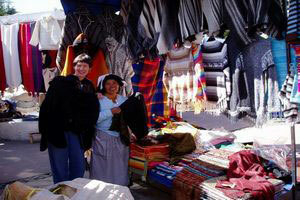 . .
Otavalo is a vibrant indigenous town located about two hours north of Quito. It is particularly famous for its Saturday market - the largest indigenous market in Latin America - that showcases the range and quality of crafts produced in the region. The Andes mountains represent the western terrestrial edge of the South American tectonic plate, being constantly pushed upwards as it rides over the Nazca plate underneath the Pacific Ocean. It is an area of constant volcanic activity with a string of volcanic peaks stretching all the way down South America. It has created stunning Andean scenery and the area around Otavalo typifies the Andes.